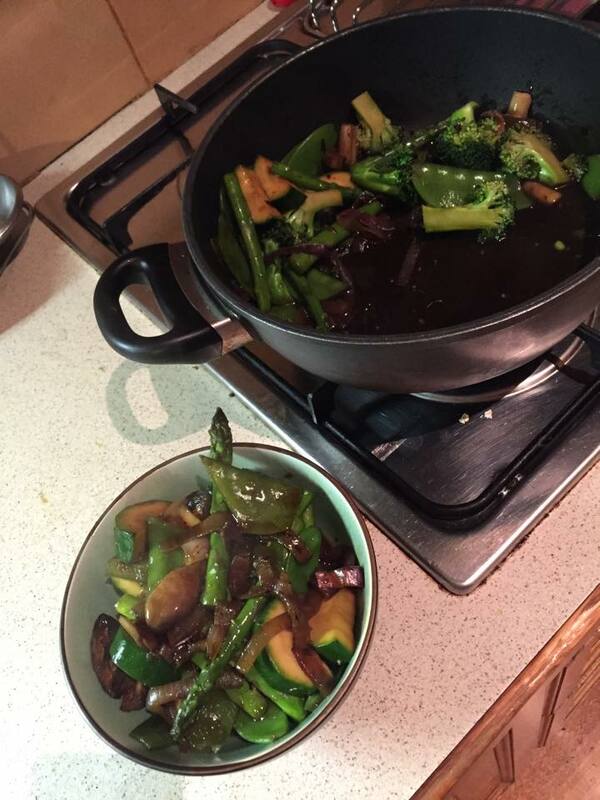 "You'll pull though in just a while… coz you're on the right track"
Putting these meals together is pretty easy – firstly I prepare my own sauce in a different pan to everyone elses. I then pull out the required sauce for the pasta eater once it’s cooked, then add the zoodles to the pans of sauces to cook. I reckon it only adds 5 minutes to the total cooking time. Fry garlic on a medium heat in a pan until fragrant and soft. Add cooked broccoli and stir through gently. Add Carnation milk and stock, and salt and pepper to taste. Simmer gently for a few minutes until hot. LCHF: cook bite-sized pieces of chicken in the pan before cooking garlic. Remove the chicken and place aside, then cook the recipe as above. Use full-fat cream instead of Carnation milk. Add chicken back in when adding the cream and stock. Add a big handful of parmesan cheese at the end of the cook and stir through. 22 yr old boy: Cook required amount of pasta as per instructions on the packet. cook bite-sized pieces of chicken in the pan before cooking garlic. Remove the chicken and place aside, then cook the recipe as above. Use full-fat cream instead of Carnation milk. Add chicken back in when adding the cream and stock. Add a big handful of parmesan cheese at the end of the cook and stir through. Serve with sauce poured over the pasta in a bowl. Stir well. I’ve reached the end of my sixth fasting day (I didn’t blog on day five, oops). Today something weird happened – I didn’t eat all of the food I’d allocated myself. I’m yet to eat my allocated apple on any fasting day, so that’s not surprising, but today I found myself arrive at dinner time having not eaten my cherry tomatoes at lunch or my cottage cheese in the afternoon either. That, combined with the apple, left me with an uneaten 188 allocated calories. Yippee!! I also decided to give a new dinner recipe a go tonight- I’d planned another stirfry, but decided I don’t want to eat that too much, lest I burn myself out and never want to eat it again. So tonight’s dinner experiment was a creamy lemon tuna pasta (zoodle pasta), and it was GOOD!!! Like really good. Not good for a fasting day- good for any day! It comes in at about 270 calories. Add tuna, mustard, lemon juice, water, stock and simmer for a couple of minutes, stirring well. So here I am at the start of fasting day #4. When I say start, I mean it’s 12:47 pm and besides my morning coffee I’m yet to eat. I’ve just made myself a cup of green tea- the hope is that if I have that, I might actually put of eating for a little bit longer than usual. Ultimately I think it will depend on how my brain goes- I can fill my stomach with water, but if my brain fades then I’ll need to eat. 5:2 so far has been an interesting exercise in reflecting on my usual eating habits, and what my body wants vs what my mind wants. Do I, for example, need to be eating breakfast on non-fasting days? If I’m fine up until 12:30 ish without food, then is breakfast just extra calories I don’t need? My PT says no, I should be eating breakfast. A high protein breakfast at that. I’m not so sure – so I’ll keep listening to my body to figure it out. So, day four of fasting, and I’ll be eating the same dinner for the third time. 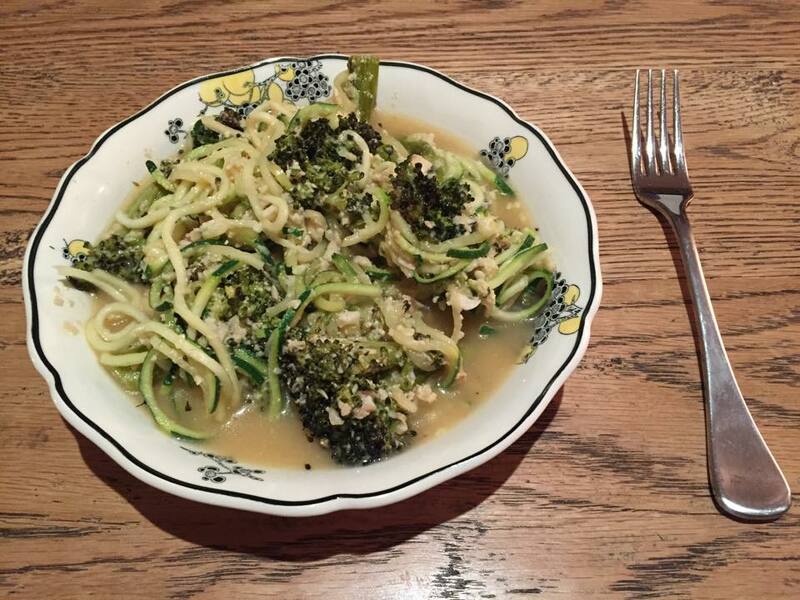 I’ve tried two different dinner recipes so far – I’m in search for some more! 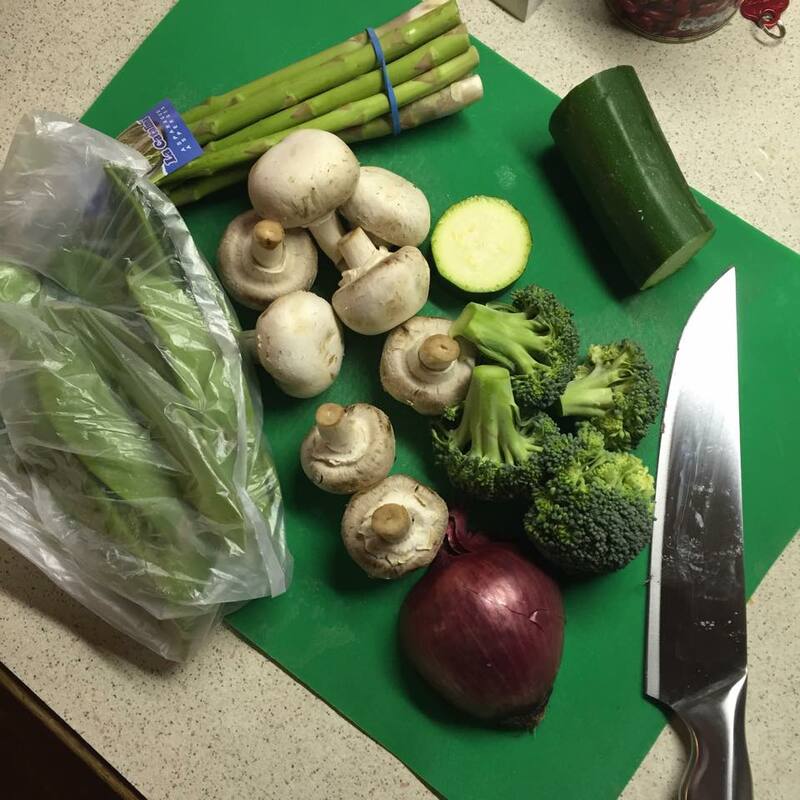 I need to refine my second one a bit before I post it here, but for now I thought I’d share my stirfry recipe that comes in under 250 calories. Add soy sauce, and salt/pepper to taste. You won’t need much/any salt, but go to town with the pepper! When veggies are cooked to you preferred softness, serve. This recipe makes two decent-seized bowls. Depending on how hungry you are, it’s more than one serve- have a play with it, and adjust according to what works best for you. If you’re not so much of an end-of-day eater, you could easily have half of this portion for lunch and half for dinner, freeing up extra calories for snacking. Note: when I’m not fasting, I make this stirfry with chicken. I just brown off the chicken before cooking the onion, remove it from the pan, and add it again to finish cooking with the rest of the veggies. A fasting day on a stressful and busy day at work is a funny thing. In some respects it’s lot easier – the more time I spend thinking about my work, or stressing about deadlines, or muddling over what my manager’s email might have meant, the less time I spend thinking about the food I’m not eating. Equally, the busier I am, the quicker my morning goes which means I start the ‘eating’ portion of my day later. On the other hand, the things I’d normally turn to for stress relief or to break up a busy day (chocolate, coffee, anything from a vending machine) aren’t available to me on fasting days. But then again, I suppose that’s a good thing. So on the balance of things, fasting day + busy work day = positive. 3:40 pm – ponder that if I hold off eating my cottage cheese util 4 pm, then I won’t eat my apple at work – I can save it for dessert! 4:10 pm – decide to hold off on the cottage cheese until 4:30 pm. I’ve got to be at work until 6, after all. 6:30 pm – get home. Weigh and chop up veggies for dinner, so I know exactly how much food I can look forward to for dinner. Marvel over the amount. 7:00 pm – consider cooking dinner, after tummy rumbles. Have a cup of tea. Muse that if I can hold off on dinner I might not need the apple, and that would save me 50 calories! 8 pm – decide I definitely don’t need the apple. 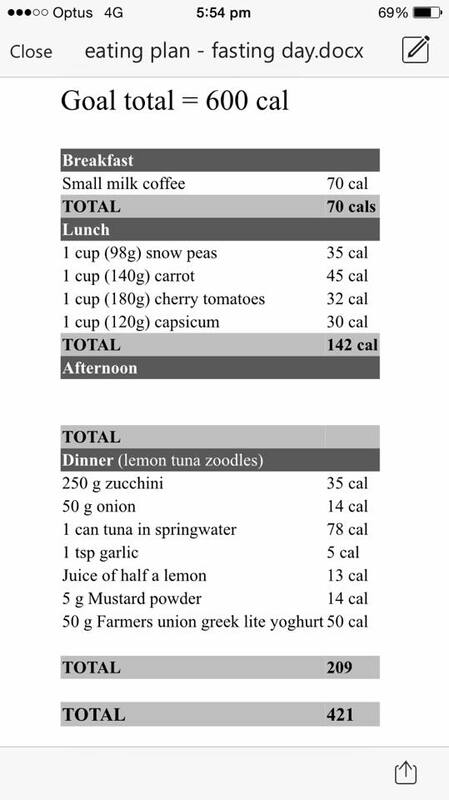 Feel awesome about not eating the apple, and therefore being closer to 500 cal than 600 cal in my day. So there you go. You can probably see from that run-down why it’s important that I hold off eating lunch as long as possible, because it’s definitely all down-hill after that point! And that’s ok, it’s not supposed to be easier, and it could definitely be a lot harder too. It’s 4:17 pm currently, so you can see what my inner dialogue’s got planned for the rest of the evening- a lot of self-negotiation! I’m trying a new low-cal dinner tonight- if it works, I’ll put it up here. Actually, I’ll put up my stirfry recipe at some stage too. Hopefully someone will find it useful! I just had a sudden thought. I know I want to be better at blogging, I know I gain satisfaction from writing it, and I enjoy reading other people’s blogs. So this year I will commit to writing at least one blog post a week. I just had a little panic when I decided I wanted to do this and realised it’s the 7th of January, but I guess that counts as being in the first week of the year. Having said that, I’m going to go by calendar weeks (Sunday – Saturday) so I guess I’m behind… whatever. We’ll all deal with it, I’m sure!!! Well, the holiday season has come and the holiday season has gone. Yesterday was my birthday, which I tend to count as the official end of my annual food and drink overload, which means it’s time to start the discipline again. The wine and cheese has been wonderful, but it’s time to return to reality. Over the season I’ve gained some weight, which is unsurprising, but really the collateral damage is a lot less than it could have been. I’m up about 1.5 kg, which puts me 7.5 kg (ish) above my goal weight. Blegh. But it’s ok- that goal weight is not exactly a “I must hit this weight!! !” goal- realistically I want to get about 5 kg off in the next few months to feel healthy again. I definitely don’t feel healthy right now. I feel a bit bloated, my clothes are tighter, and I don’t feel as strong as I did. My energy is down, but I know that’s all food related. I actually stayed relatively active across the break, doing plenty of hiking and getting lots of km under my feet, but it’s just not the same as doing the hard weights-based workouts. Having said that, I will not do this if it is going to compromise the exercise I do each week. Part of this action is learning how to self-direct and self-motivate in the gym, particularly on the weights floor. I still want to be doing weights 3 times a week at the gym and doing a bodyweight/cardio workout twice a week at work as an absolute minimum. I was getting really good at this for a while last year. It was saving me money, and it was helping me eat the kind of food I wanted in my body. But life got busy, and it all slipped, and next thing I knew I was spending upwards of $22 just on breakfast and lunch, and eating out way more than was reasonable for dinner. So that’s going to stop. I’m going to pre-prepare breakfasts and lunches again, and think ahead for dinners. If I don’t have the time to cook, I’ll make sure I’ve got food in the freezer. I’ve never done week-ahead meal planning before- I tend to be an on-the-day buyer and cook, but I can see how much that will help save money and food wastage. On Monday night I cooked my first proper dinner for a long time. When I say ‘proper’, I mean a meal that I though about ahead of time, looked up a recipe for and didn’t just slap together. I think there’s a big difference between cooking to eat and cooking to nourish (both body and soul). I really enjoy cooking when I have the time and space to do it, and that’s what I mean by cooking to nourish. It’s cooking with some love in it (nawww, that’s a bit corny!!). 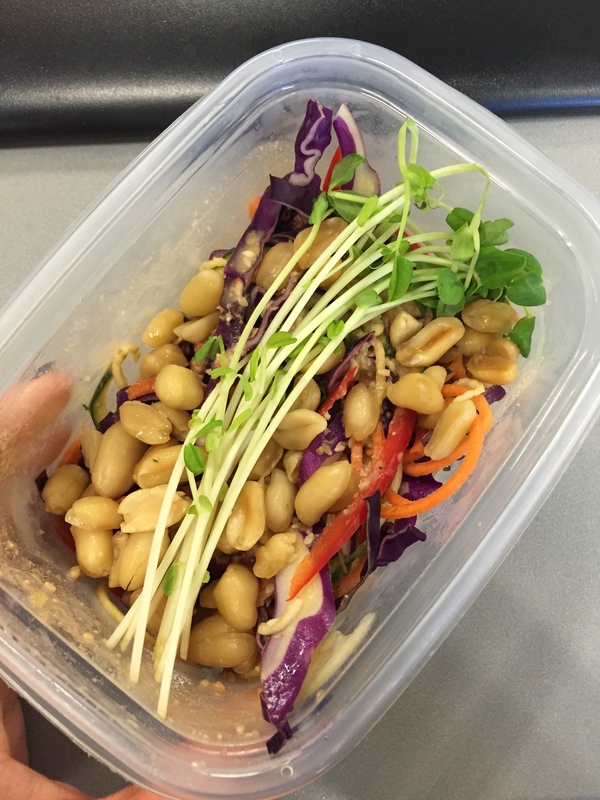 Anyway, I made the most incredible Thai salad/raw pad Thai that I found over at elsaswholesomelife. I’ve included some photos of my version here, but seriously go check out hers- they are much much prettier! 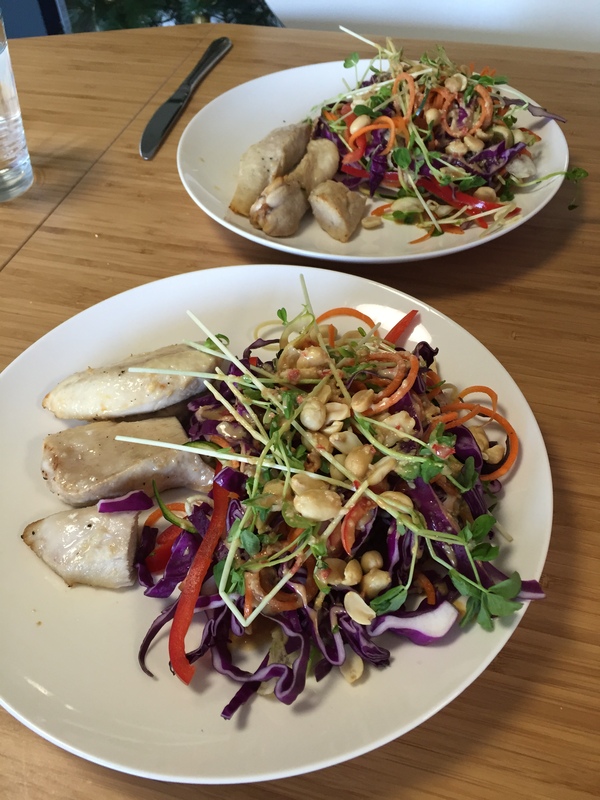 Thanks Ellie for this great dish- I’ve just finished eating it for lunch, and I’ll be making some more tonight. This stuff is addictive. 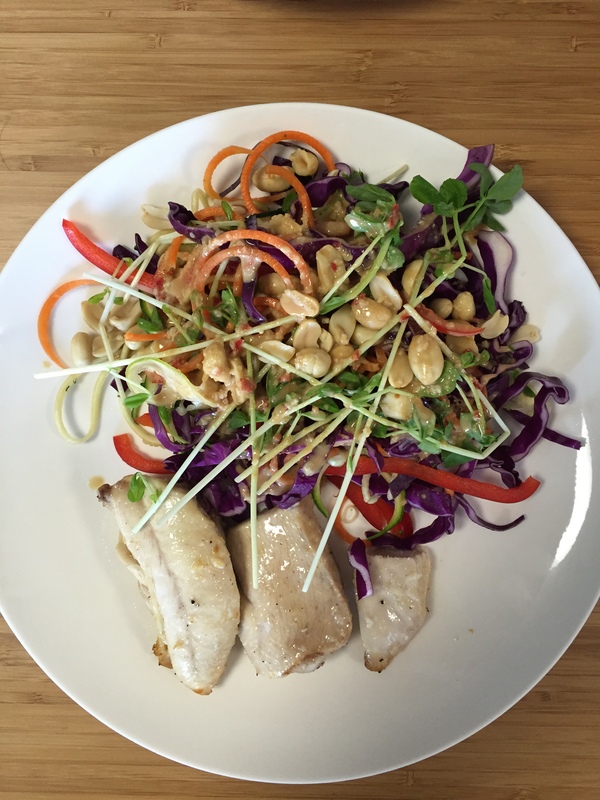 For the raw thai salad check out the original recipe– I pretty much followed it to a T, although I used rapadura sugar instead of coconut sugar, and omitted the edamame beans in favour of ginger lime chicken. Combine ingredients in a bowl. Add chicken and stir, then allow to marinate for as long as you can (half an hour minimum). Place chicken on a lined baking tray and discard marinade. Bake for 20-25 mins at 180 degrees. It’s b een a while since I posted here. Ages in fact!! There are things I want to write about soon (triggers, achievements, frustrations, hiking….) but I have no time right now, so keep an eye out soon. Or reasonably soon, at least. Since I’m pretty busy today but I’m also super aware of how long it’s been since I wrote anything, I thought I’d do a quick hello. 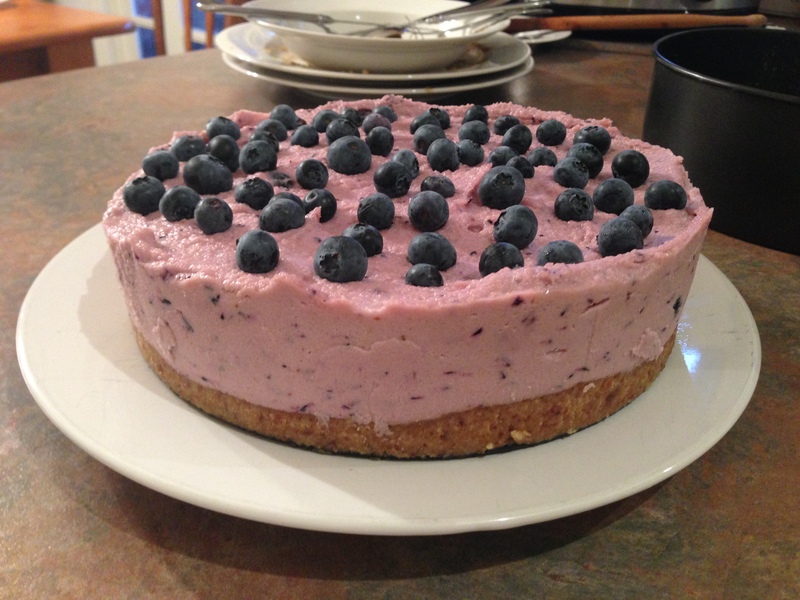 I figure that a picture speaks a thousand words, so here’s a couple of pictures of a raw blueberry and lemon cheesecake I made recently. Being raw it’s vegan, gluten and dairy free too (although when I say it is what I mean is it can be. I used honey (not vegan) and roasted nuts (not raw), but it doesn’t really matter. I used this amazing recipe from Raw Food Recipes and I’ve gotta say- 6 and a half cups of nuts in one cake is a looooot, but most definitely worth it for the number of portions you get. The lemon in this recipe gives the cake a real “cheesecake” flavour- I served it to a room of dedicated non-raw eaters, and they all loved it. Anyway, enough writing. Enjoy the pictures. Wow, it’s been a LONG time!! Workout 16/05/2016 – my first ever hour long PT session!